I have yet to meet a Susan May Warren novel I didn’t love. Her versatility as a writer is absolutely amazing. Her light contemporary romances have tickled and charmed me. Her historical romances resonate with the sight, sounds, and scents of the era. Her characters are well-rounded, flawed, and so incredibly real that I emerse myself in their sorrows and joys as I would members of my own household. Heiress is no exception — in fact, Heiress just might be Susan’s best book to date, and that is no small fete. The beautiful heiress daughters of newspaper magnate August Price have been given everything their hearts desire. But what if they want only to be loved–without an enormous price tag attached? When one daughter pursues a desirable marriage, she secures for herself a comfortable and glamorous life. But among the duties of privilege, will she also find the happily-ever-after she seeks? Her sister rejects the trappings of wealth, choosing instead to build a new life on the still-untamed frontier. Will she find happiness in independence or discover that she’s left her heart behind in New York’s glittering society? Set in the opulent world of the Gilded Age, each woman discovers that being an heiress just might cost her everything–including the chance for true love. 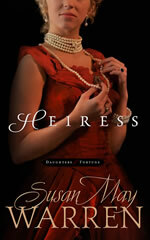 Susan May Warren is thrilled to announce the release of her latest historical book, Heiress! Find out what the reviewers are saying here! Heiress, a richly complex historical romance, is the first in Susan’s three book Daughters of Fortune series. In honor of Heiress’ debut, Susan is hosting a FABULOUS Gilded Age Giveaway and giving away an opulent prize pack fit for an heiress! Click one of the icons below to enter. But do so soon – this giveaway ends 10/5/11. The winner will be announced Thursday, October 6 on Susan’s blog. 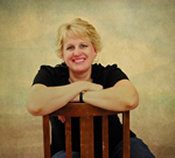 Susan May Warren is the best-selling author of more than thirty novels whose compelling plots and unforgettable characters have earned her acclaim from readers and reviewers alike. She is a winner of the ACFW Carol Award, the RITA Award, and the Inspirational Readers Choice Award and a nominee for the Christy Award. Former missionaries to Russia, Susan and her husband have four children and live in a small Minnesota town on the shore of beautiful Lake Superior, where they are active in their local church. I haven’t read anything by Warren yet. This sounds good. This must be the year for books on the Gilded Age — I’ve read two books set in that time already this year and have seen one or two more.